The steeple of St Peter and St Paul’s in Gosberton reaches 160 feet into the Lincolnshire sky. Stone spires are a special feature of churches in the East Midlands, and Gosberton’s is one of the loveliest. Each angle of the octagon is decorated with little crockets, while four exceedingly thin – and structurally useless – flying buttresses connect it with the tower corners. The whole elegant construction dates from about 1300. But the most surprising thing about this spire is the elephant carved on the east side of the tower. This drawing, which I found in the 1963 AA Book of the Road, is very evocative, though there’s a modern photograph in this recent story about the church repairs in the Spalding Guardian. The elephant is a gargoyle, a sculptured stone spout used in the Middle Ages to throw rain water away from the building, and its trunk is made of lead that needs to be renewed. Whoever carved the elephant, probably a jobbing mason who would follow the work from site to site, was very unlikely to have seen an elephant so the accuracy of the representation is remarkable. 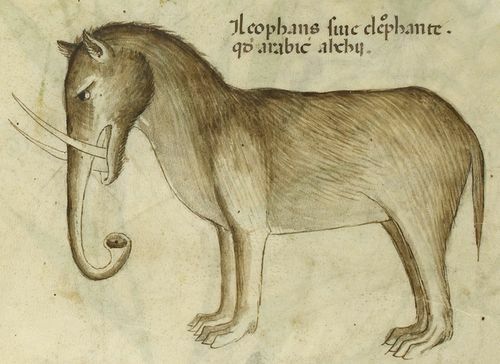 This image, from a 15th century herbal held in the British Library, is characteristic how medieval artists imagined the strange creatures travellers told stories about. 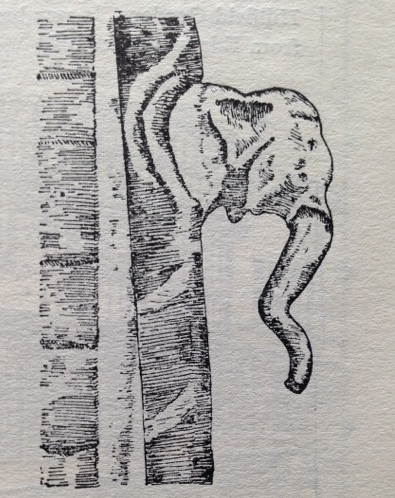 Perhaps the Gosberton sculptor had encountered a real elephant in his journeyman life.